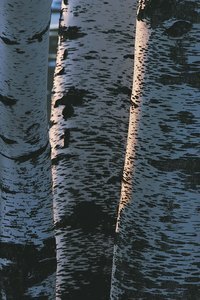 Birch trees are known for having a unique and versatile bark that people have used in the making of many arts and crafts for years. However, a more environmentally friendly way to achieve the naturally pretty appearance of birch bark without harming any trees exists. With a few painting techniques, you can use a faux birch bark finish to transform the look of such items as picture frames, purse handles or fishing rods. Use a stiff bristle paint brush to entirely paint the item that you are transforming into faux birch bark with black acrylic paint. Allow the paint to dry completely. Cover the item with a thick coat of white school glue. Give the glue enough time to partially dry. Dab the paint brush with white acrylic gesso and a small amount of black acrylic paint. Paint long, horizontal strokes across the item. Avoid overlapping the paint strokes in order to create a more authentic birch bark cracked appearance. Allow the paint to completely dry once you have painted the entire item. Dip the paint brush in brown acrylic paint and then wipe 95 percent of the paint off the paint brush with a paper towel. Lightly swipe the almost-dry paint brush back and forth over the entire item in a dusting motion. Allow the paint to dry once more. Highlight portions of the item with white acrylic gesso to create small areas of unblemished white birch bark. Let the item dry completely. Apply a coat of acrylic sealer to the entire item to protect the faux birch bark that you have created.